Ideally this is the scenario : You have a wifi enabled laptop and a wired/wireless internet connection through which you access the internet, you also have one or more smartphones/tablets or any other wifi devices. What you do not have, is a piece of hardware called wireless router, which creates a wifi network for all your devices. What you want : is to connect any or all of your devices to your own personal wifi network. All you need is a small piece of free software called "Virtual Router" from http://virtualrouter.codeplex.com which is a software based virtual router. 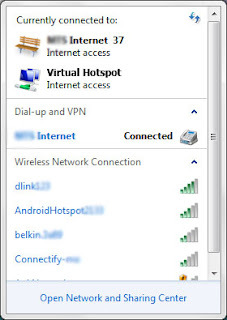 Set a password for your hotspot and select the internet connection in the shared connection drop down. 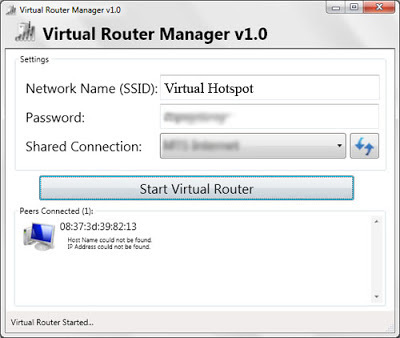 and right click and change the "properties" of Microsoft Virtual WiFi Miniport Adapter and go to sharing tab then click the check mark to allow other users to share the internet connection. Congratulations! now you have a free private wifi network for all your wifi devices.